Anthony Watts is scraping the bottom of the barrel again on WUWT. He only has a couple of posts up so far today. In one he is expressing shock horror at a couple of tweets between scientists. Anthony feigns surprise that Michael Mann doesn't tolerate disinformation-spewing trolls like BishopHill*. What does he expect? That anyone other than snark bloggers and the denialiti would pay them any mind? In another he publishes an incomprehensible article by Ed Hoskins, who previously wrote that we are on the verge of an ice age. If we were to continue to increase emissions at an exponential rate and achieve 1000 ppm by 2100 the average global surface temperature could get up past four degrees even this century. Just think how that might affect extremes. Temperate Melbourne has already had temperatures of 47 degrees. Even cold Hobart has hit more than 42 degrees. Imagine if it got to 55 degrees, or 60 degrees! Well I'm not even sure it could happen. The reason I have some doubts is because if we head towards that, then some time on or shortly after the middle of the century, the weather would be such that societies would become dysfunctional and economic activity would wind down enormously, therefore burning fossil fuels would be reduced significantly. Agricultural production would all but cease in many countries. Water supplies would be made unreliable by unpredictable excessive downpours and droughts. Millions, maybe billions would have died from intolerable heat, storms, floods, famine and disease. Transport and communications infrastructure would be broken beyond repair. There would be civil wars and wars between nations that still had the wherewithall to muster an armed force. There would be epidemics and pandemics of disease. Pests would proliferate and spread. Plants wouldn't be suffering from lack of CO2. They'd be suffering from lack of water or too much of it. They'd be suffering from heat stress - the ones that were still able to germinate and send up shoots. With a quietening sun, changing ocean circulation patterns and the present evidence of much colder winters in the Northern Hemisphere over the past 5 years, that cooling could already be upon us. The cooling climate could well last for many decades or even centuries. The winters of the last year or two might have seemed colder and some cold records might have been broken even. But the coldest of them was still hotter than the 1951-80 average by 0.5 degrees Celsius. In 2007 the northern hemisphere had the hottest winter on record so far at a whopping 1.1 degrees hotter than the 1951-1980 average. Whoops! The northern hemisphere summer temperatures are shooting way up! Whoops again - northern hemisphere winters are getting warmer faster than summers! And globally the earth just keeps on getting hotter and hotter. Ed does some weird arithmetic to "prove" that cutting carbon emissions won't cut carbon emissions. The fact is that if we replace fossil fuel-based energy with renewable energy we still have a chance of limiting the rise to two degrees, which will be bad enough. But we have to get a move on. I also see that in his "paper" Ed Hoskins has referred to David Archibald as if he is a reputable sceptic. David's prediction is that before seven years is out, earth will get colder than it was in the Little Ice Age! And Anthony wonders why climate scientists don't bother 'debating' fake sceptics and disinformation propagandists! June 8, 2013 at 11:40 am Not the ‘root cause’? There is no scientific evidence that CO2 is any cause of global warming. 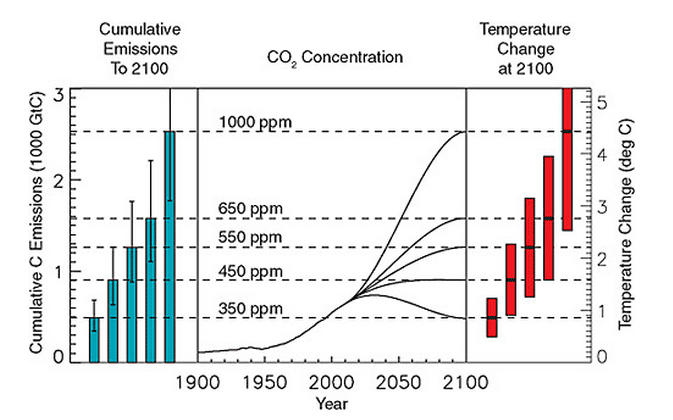 Of course it is possible that CO2 causes some minuscule warming. However, there is no verifiable and testable supporting evidence that this is so. There are empirical observations showing that CO2 levels are a direct response to changing temperatures. But there are NO such measurements showing that rising CO2 is the cause of rising global temperatures. None. Within the Scientific Method, the only conclusion to be reached is that CO2 does not matter regarding global temperatures. If that is wrong, anyone is free to post their empirical observations right here, showing that ∆CO2 in fact causes ∆T. This challenge has been on offer for months. But so far — no takers. Not only is there ample evidence in the scientific literature, David and Janice, but since 1988 scientists have volunteered their time to pull this information together and provide comprehensive reports. For a shorter readable account of how the greenhouse effect works, look no further than this booklet from the Australian Bureau of Meteorology. As Ryan notes, just last week WUWT was telling everyone that it wasn't people causing the rise in CO2, it was insects. Anthony Watts can't get his story straight. And he wonders why real scientists won't bother to pass the time of day with him. Did you check out the comment tread at Willard's arctic ice poll thread? Dbstealey, aka smokey, posted a couple links to Steve Goddard's science fiction blog. Meanwhile Steve Mosher rattled the bars on Watt's cage by posting three videos featuring Jennifer Francis, including one that was produced by Willard's arch-nemesis, Peter Sinclair, aka greenman3610. I'm surprised Anthony allowed it. I expect he still tolerates Mosher because of his role in promoting the stolen CRU emails. I'm not sure how much longer he'll last before Anthony does what he did to Muller and disowns him.